by Charles McRaven. Softbound, 256 pages, 7" x 9". Simple, clear instructions with step-by-step photography show how to build a forge, make and/or acquire tools, and use those tools to create items of lasting beauty and durability. 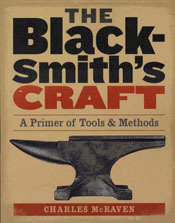 Read it as an important historical document, a celebration of a traditional American skill, or use it as a practical primer for working with metal.